Soon after Dr Jacob Chandy, another prodigal son of India, Dr. B. Ramamurthi, returned after being fully trained at Newcastle-upon-Tyne, UK and Montreal Neurological Institute, Montreal, Canada, to lay the foundation of neurosciences in the country. 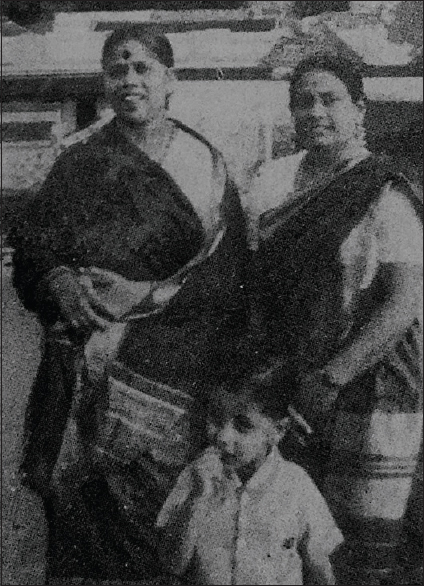 Figure 2: Mother “Chinamma”, wife Dr. Indira Ramamurthi and nephew Sridhar. Growing up in a loving environment, BR studied at the ER High School at Trichy. He ranked second in the state in the Secondary School Leaving Certificate (SSLC) examination. In addition to the regular subjects, he learnt Sanskrit at home from a private tutor. He joined St. Joseph's College for F. Sc. (+12 examination) and won many awards and prizes during these two years. He did very well at the Board Examination, securing highest marks awarded by the University in Mathematics. Interestingly, he did not study Biology in the Intermediate (+12) level and yet had no difficulty in getting admitted to the Madras Medical College, from where he graduated in 1943. 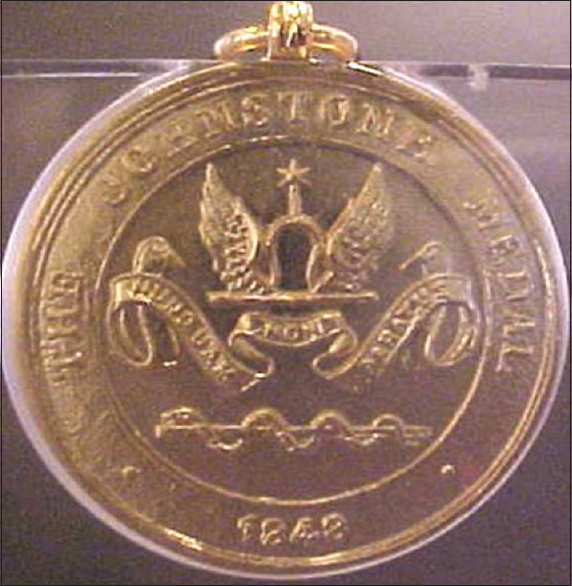 Once again, he received many awards including the much coveted Johnstone Medal for standing first [Figure 3]. He opted to specialise in Surgery and joined post-graduate study under Prof. N.S. Narsimha lyer. He obtained the MS degree in 1947 [Figure 4]. 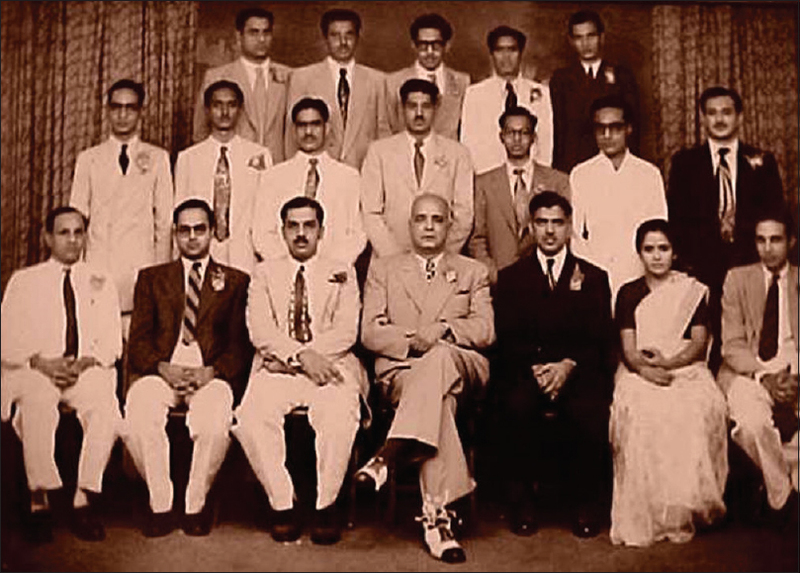 Just prior to completing his MS examination, in October 1947, the ‘Interim Government of India’ headed by Jawaharlal Nehru invited applications for speciality training in medical subjects. 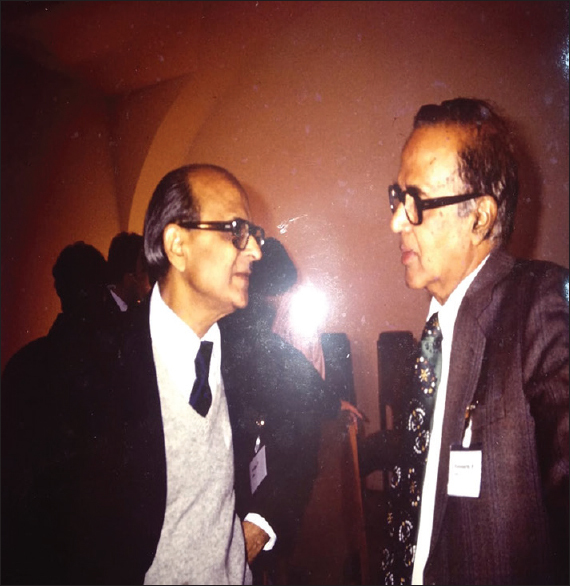 While he was inclined to specialise in Thoracic Surgery, his mentor Prof. lyer advised him to apply for Neurosurgery as “This is a new speciality unknown in India”. An interview was held in Simla (now Shimla) in April 1947. Interestingly at the end of the interview he was told, “You have done well but you are too young to be selected”. Dr. Ginde and Dr. Omar Jooma (who migrated to Pakistan) were selected. In the meanwhile, Cupid's arrow struck, and he fell head over heels in love for his classmate - a bright, “Chic and Charming” Indra Lakshmipathi, daughter of Dr. Achanta Lakshmipathi and Smt. Rukmini Lakshmipathi. Dr. Lakshmipathi, who was a qualified ophthalmic surgeon, later became a renowned practitioner of Ayurveda and published some of the most authentic books on the subject. Smt. Rukmini was a great patriot, became the President of State Congress Committee, was imprisoned on several occasions. and later became the Health Minister. 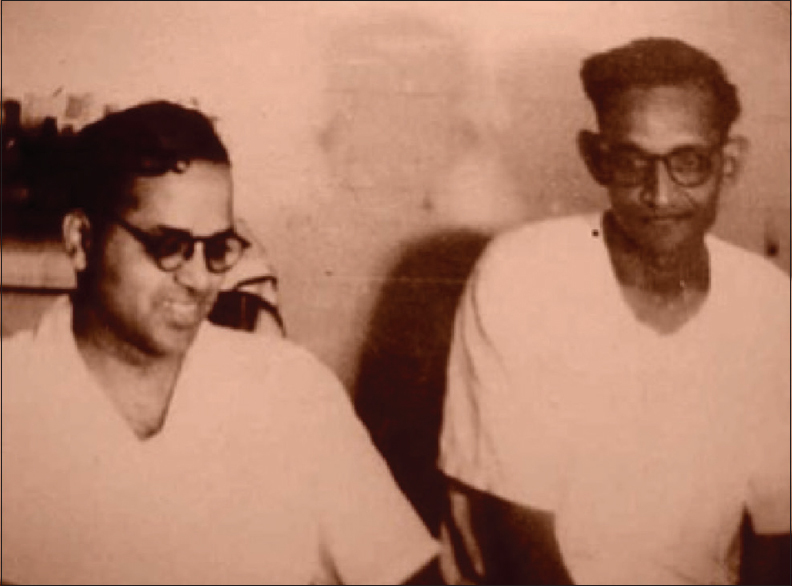 After a short surreptitious romance, they got married on 25 May, 1945 in Madras (Chennai), while they were still working as house surgeons. She proved to be the proverbial “woman behind the man” in the true sense. BR went to Edinburgh in July 1947, a month before India's independence. Within 3 months of arriving there, he qualified for the Fellowship of the Royal College of Surgeons (FRCS)- a truly remarkable feat. Having failed to get the Central Fellowship (referred above), he successfully applied for a state sponsored programme. He sailed for UK again in November 1948. The Government of Madras agreed for him to work with Sir Geoffrey Jefferson at Manchester, UK, for 18 months. However, Prof. Jefferson sent word that he had too many war returned trainees under him and that BR should proceed to Newcastle - upon -Tyne to work with Mr. G.F. Rowbotham, who had only one assistant at that time. This provided BR an immense opportunity for hands-on training. During this period, he was encouraged to visit other important neurosurgical centres in Europe. He thus visited Zurich, Copenhagen, and Stockholm, where he met the contemporary leaders of Neurosurgery such as Profs. Krayenbuhl, Olivecrona, Edward Busch, Gosta V. Norlen and Lars Leksell. He also attended the first post-war International Congress of Neurology in Paris in September 1949. It was during this period that his wife Indira came to London and obtained her Member of Royal College of Obstetrics and Gynaecology (MRCOG) certification. 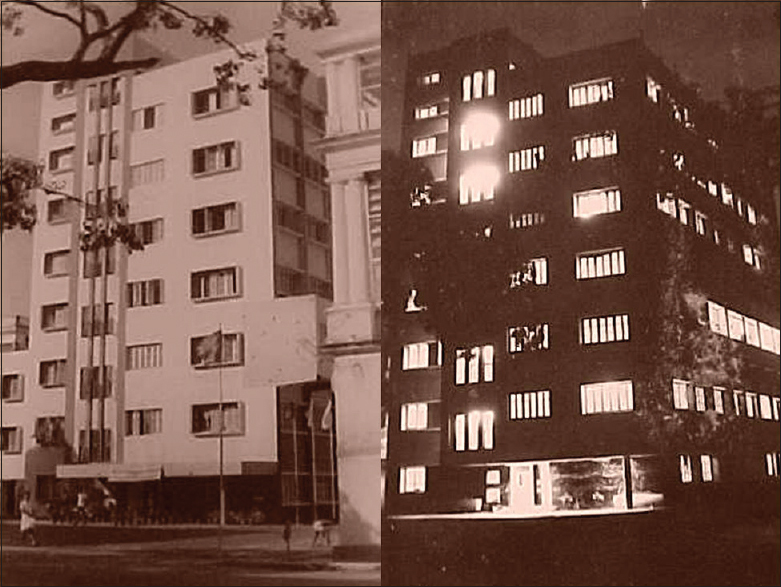 BR left Newcastle in January 1950 to spend six months at the Montreal Neurological Institute, Montreal, Canada, which had acquired the status of the Mecca of Neurosciences. 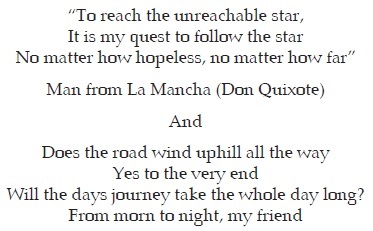 The farewell advice given to him by Dr. Rowbotham is worth quoting since I got a similar advice from my mentor, Dr Kristiansen, and more so, as it is as relevant today for all trainees leaving their ‘nest’. “When you go back to your country, “Your first aim should be to make neurosurgery known and accepted in India. Hence you should not choose any heroic surgery in the first few years but concentrate on good results”. And, “I can teach a chimpanzee to operate, but I cannot make it think. Operate a lot by all means but think more………….”. Already having received enough clinical and surgical exposure at Newcastle, BR decided to benefit from the overall academic milieu at MNI. In contrast to the environment at Newcastle, he found the atmosphere at MNI to be completely academic. He, therefore, spent time in the Electroencephalogram- Neurophysiology and Neuropathology departments. At the end of his time at MNI, and with Dr Penfield's letters of introduction, he visited other centres in Canada and USA. Coming back to UK, prior to departure for India, he again visited several other neurosurgical centres. 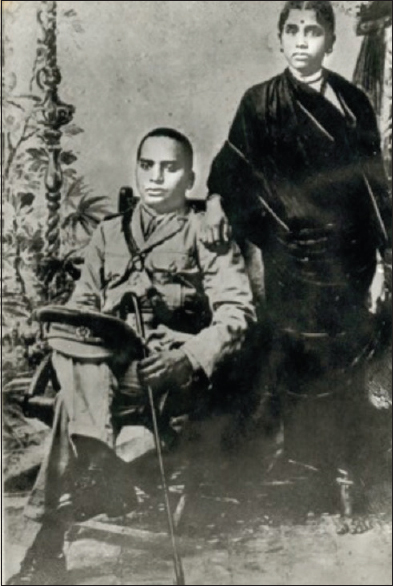 On the Vijayadasami day, October 1950, BR joined as an Assistant Surgeon in his Alma Mater – the Madras Medical College., Thus began the journey “Uphill all the way”. Like all pioneers, who laid the foundation of new disciplines, BR faced the same horrendous difficulties. To quote him, “There was nothing at all in the General Hospital for any neurosurgical work and everything had to be started from scratch”. “I used to stand in the corridor of the General Hospital and request all the passing assistant surgeons to assist me, many did”. “There was jealousy, there was prejudice against a young person, there was the communal virus, and there was sheer cussedness. But these were overwhelmed by the encouragement, the kindness and appreciation of many_ _ _. While in UK, I had saved money and bought some instruments for craniotomy. Most patients arrived late with advanced disease, 80% of patients with brain tumours were already blind”. “Under the circumstances, no doubt, the mortality was high and one out of three patients died soon after operation”, “It required great courage, determination and optimism to go to the ward the next day and get the next patient to agree to the operation”. Progressively with patience, persuasion and hard work, the initial four beds in general surgery ward expanded to give place to an independent ward and operation theatre, and ultimately to the “Madras Neurological Institute”. 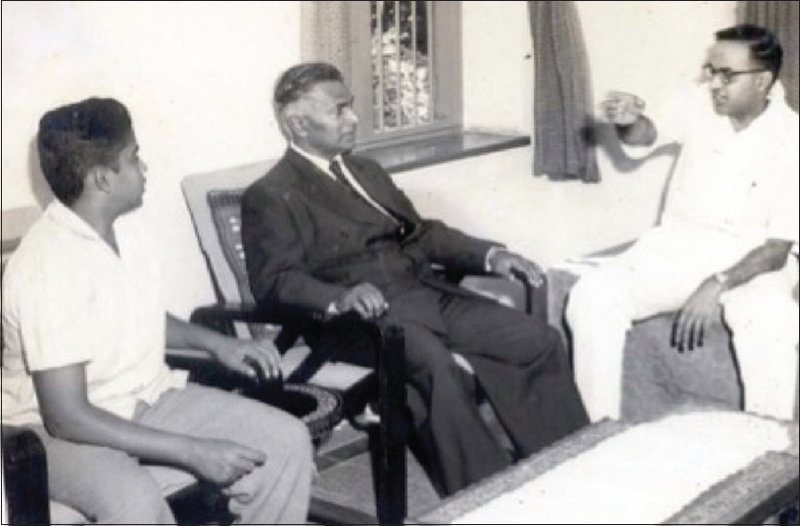 With the support of Shri Annadurai, the Chief Minister and once BR's patient, and against the Dean's declaration that, ‘You can build the Institute here in General Hospital only over my dead body’, the Institute came into existence. By 1960, the Departments of Neurosurgery both at Vellore and Madras had grown in usefulness and reputation _ _ _. It was clear that time had come for India to train her own neurosurgeons. An initiative was taken by Dr. Chandy, who with his stature and influence was able to convince Shri A.L. Mudaliar, Vice-Chancellor of the Madras University to approve the introduction of the MS Neurosurgery course. This pioneering step emerged as a real path breaker for super speciality education in India. There was no stopping the progress of not only neurosurgery but neurosciences in the country with Vellore and Madras taking the lead. Not that opposition and obstructions were not faced at every step”. Two years after starting Neurosurgery, BR managed to attract the services of Dr. Mahadevan Pillai, a trained radiologist experienced in cerebral angiography and Drs. 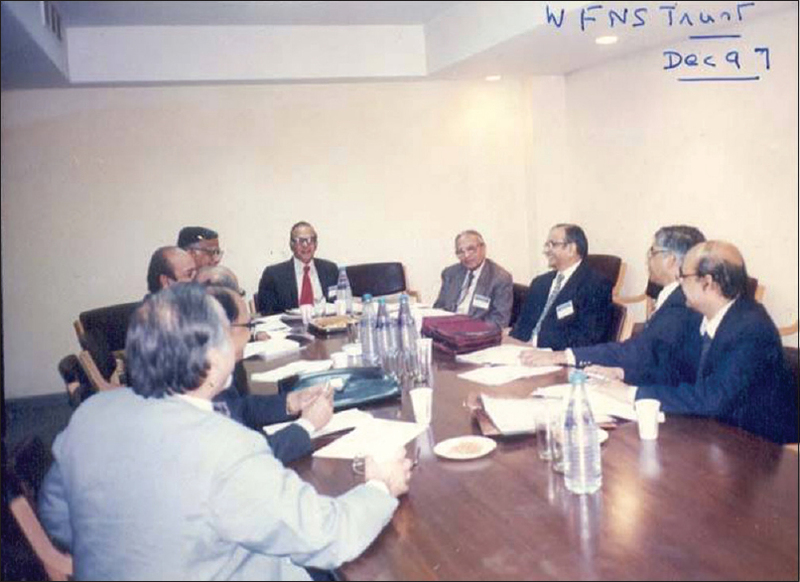 Kabir and Rajagopal, his old class fellows as neuroanaesthetists [Figure 5]. In the meanwhile, his friend Dr. S.T. Narsimhan returned from USA and established a private clinic with facilities for an electroencephalogram (EEG), and was given an honorary post in the Department. A few years later, Dr. M.G. Varadarajan replaced Dr. Pillai as a neuroradiologist. 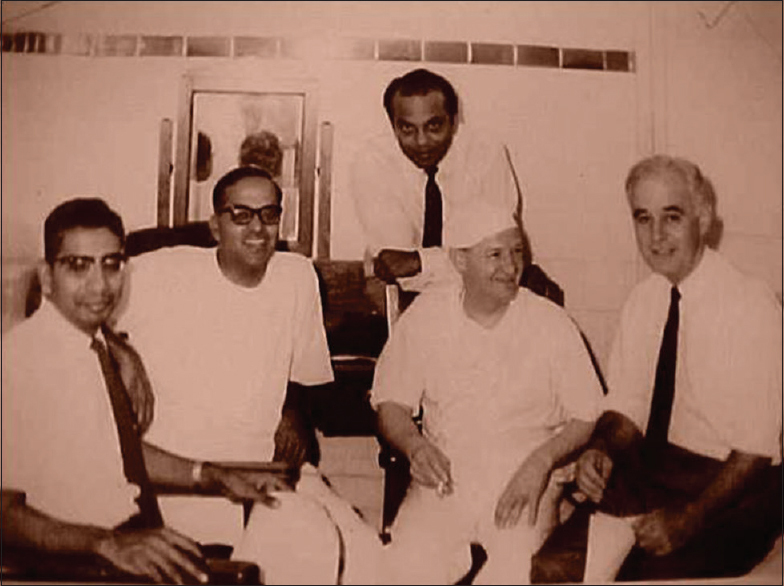 It was only in 1957 that Dr. Arjun Das initiated the Neurology Clinic in BR's outpatient. He was later sent to England for training in EEG and on return was appointed as Professor of Electroencephalography in 1960. He was soon joined byDr. 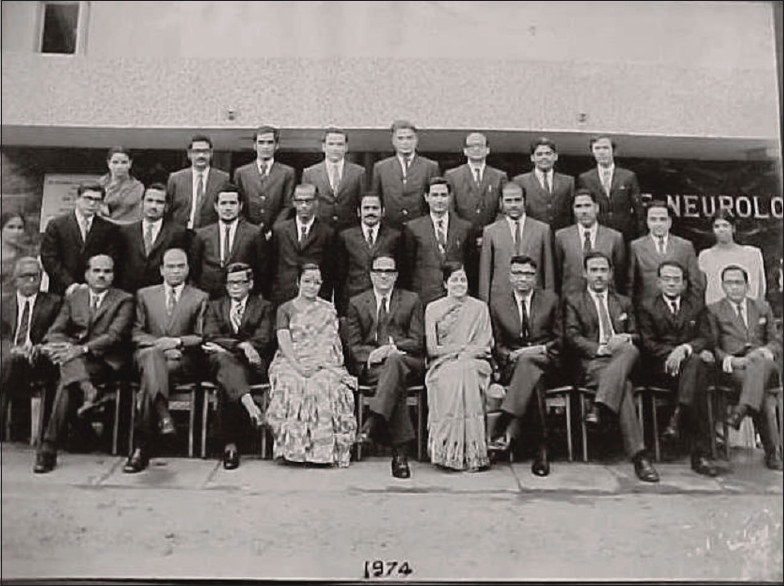 K. Jagannathan who after training in Neurology at Queen's Square London under the Colombo Plan Fellowship, joined BR in 1960, and ultimately rose to be a Professor in 1966. By 1960, it was clear that the time had come to start training our own future specialists. With the efforts of Dr. Chandy, Madras University approved the initiation of MS (Neurosurgery) at Vellore and Madras. This was a post MS (General Surgery) two-year course. Dr. V. Balasubramanian was the first candidate to join (Dr. Balparmeshwar Rao from Vizag had received his neurosurgical training with BR prior to this). He was soon followed by Dr. M. Natarajan, to be succeeded by a galaxy of doctors. 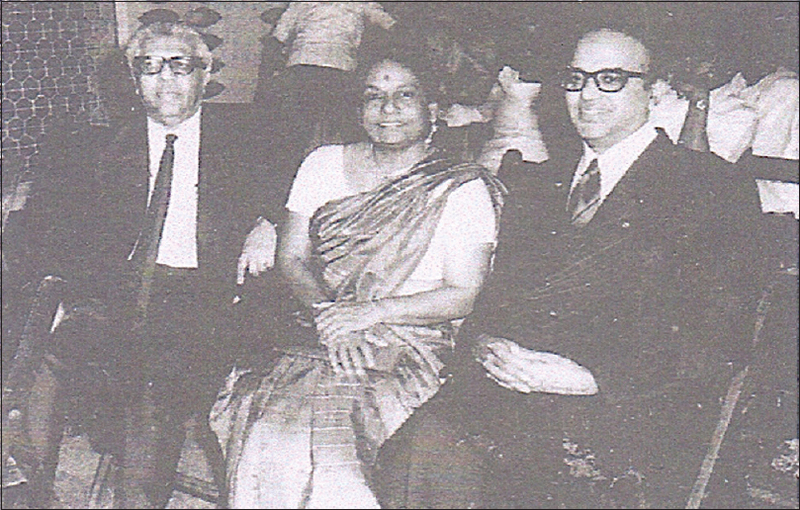 In 1965, Dr. S. Kalyanaraman, trained under Prof. Norman Dott and Prof. John Gillingham at Edinburgh, joined BR. Others, like Dr. Sarasa Bharathi in Neuropathology, and Dr. Velu Muruggendran in Neuro-chemistry progressively added to the growing Neuroscience family at Madras General Hospital (MGH). The year 1960 brought another feather in BR's cap. Requested to examine General Shrinagesh, Governor of Andhra Pradesh, who was suffering from Parkinson's disease, he was asked if surgery could be done by him (Gen. Shrinagesh had already been operated upon on one side in London by Mr. Lawrence Walsh and now needed the operation on the other side). BR informed him that it would be possible if the necessary sets of equipment were made available [Figure 6]. Immediately at 11 p.m., Gen. Shrinagesh telephoned Pandit Jawaharlal Nehru, the erstwhile prime minister of India, and got his approval to invite Mr. Walsh along with all the required equipment under the Commonwealth Aids Scheme. Thus began the stereotaxy unit, which in coming years acquired international recognition [Figure 7]. With patience, preservation, persuasive skill and “Chanakya niti,” in 1970, BR succeeded in getting his dream of creating an Institute of Neurology fulfilled [Figure 8]. Thus, the 1970's witnessed the growth in reputation of both BR and his Institute by leaps and bounds, nationally and internationally [Figure 9]. 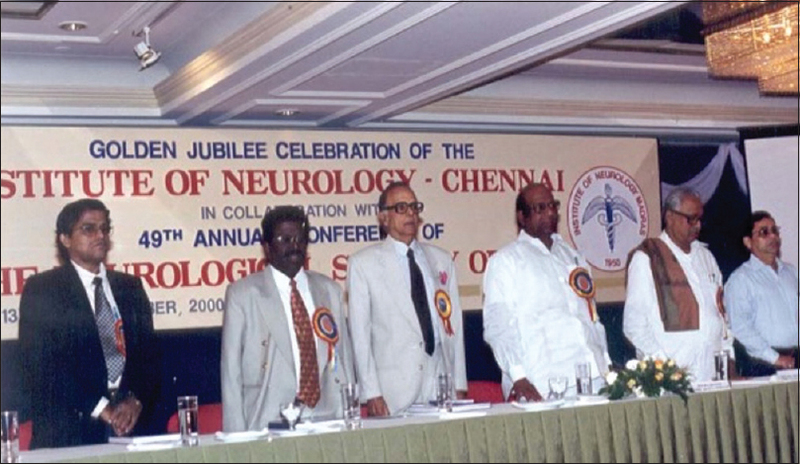 Host of foreign dignitaries participated in the celebrations of the 20th and 25th anniversaries of the initiation of Neurosurgery at Madras General Hospital. Unfortunately, owing to political manoeuvring, his shining career came to a sudden end on 30th January 1978 at the young age of 56. Unfortunately, this also brought an eclipse of the now internationally famous Madras Neurological Institute. I cannot resist quoting BR himself in this regard: “The Institute of Neurology, built up with so much love and dedication, with so much of effort and determination, and with so much of help and good-will, shone like a brilliant meteor for some years from 1970, and like a meteor went into oblivion. When a child brought up with all affection and provided with all opportunities, turns out to be a non-entity, the parent's heart bleeds”. He goes on to lament, “One is amazed how an unreasonable hatred and jealousy could be used to wreck an institution so laboriously built. The loss is not for the individual who brought the edifice down, but for the public, the students and for Neurosurgery”. “A small help rendered years earlier created the Institute of Neurology and a small mistake committed twenty years later destroyed the Institute. Amazing are the ways of providence”. He goes on to say, “Thus, perhaps one can understand why I say I am jealous of the achievements of R.M. 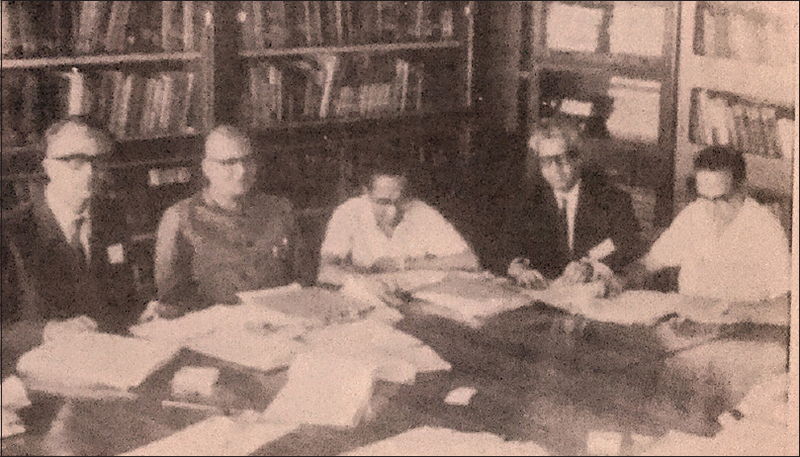 Verma, Prakash Tandon, Valiathan and others who have established flourishing centres of science in our country” [Figure 10] and [Figure 11]. Undeterred by this unexpected, undeserved event, BR with the help- both moral and financial (of his wife)- went ahead to establish another centre - Dr. Achanta Lakshipathi Neurological Centre, under the aegis of the Voluntary Health Services (VHS) - a brain child of Dr. K.S. Sanjivi. BR devoted the last twenty-five years of his life to untiringly build it as a centre of excellence [Figure 12], [Figure 13], [Figure 14], [Figure 15], [Figure 16]. Dr. Ramamurthi, from the beginning of his career, had a broader vision beyond Neurosurgery. Like Dr. Chandy, he promoted the development of Neurology, Neuroradiology, Neuropathology, Neurochemistry. He was a prolific investigator who published over 300 scientific papers and co-edited the Textbook of Neurosurgery (Three editions), Textbook of Operative Neurosurgery and contributed chapters to several prestigious books in the field, including the Handbook of Neurology. 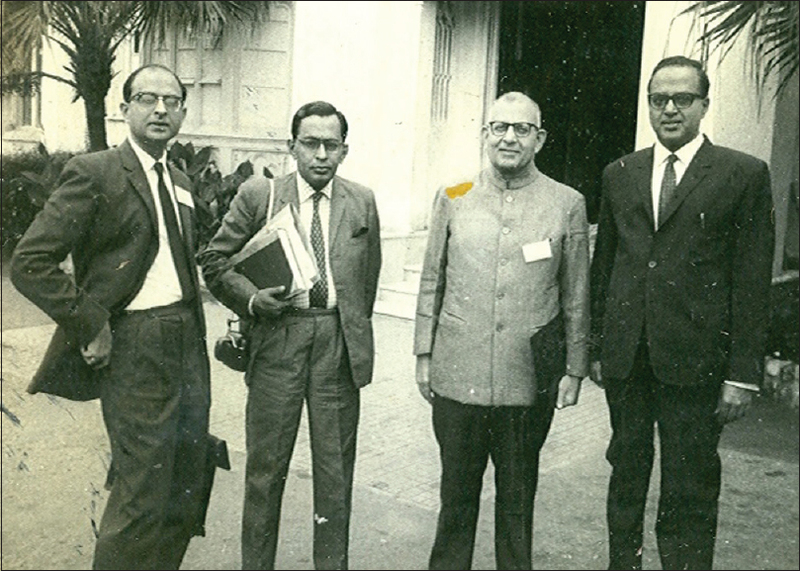 A brief account of his contributions to Indian neurosurgery can be obtained from my paper: Prof. B Ramamurthy: Contributions to Indian Neurosurgery (A personal tribute). Neurol India 2, 18-20,2004. He was a globe-trotter in search of advancing his knowledge and skills and could claim most of the well-known neuroscientists all over the world as his friends. Not only was he one of the four founder members of the Neurological Society of India (now having nearly 3000 members), and later its President, he was also the President of the Surgeons Association of India; the 9th International Congress of Neurosurgery; the Indian Association of History of Medicine; the National Academy of Medical Sciences; the National Board of Examination; the Indian Association of Biomedical Scientists of India; and, the Honorary President of the World Federation of Neurosurgical Societies. He was an elected Fellow of all the three science academies in India in addition to the National Academy of Medical Sciences. He helped in establishing the Middle East Neurosurgical Society, the Asian Australasian Association of Neurosurgeons, the South Asian Association of Neurosurgeons and was an Honorary Member of Australian Society of Neurosurgeons; Society of Neurological Surgeons, USA; American Academy of Neurosurgeons; Japanese Neurosurgical Society; Scandinavian Neurosurgical Society; and, Congress of Neurological Surgeons. He was an Honorary President of the Asian and Australian Congress of Neurosurgery. It is not surprising that he was a recipient of a large number of awards and honours beginning with the prestigious Johnstone Medal at the time of his graduation. Others included John Bruce Gold Medal of the Royal College of Surgeons of Edinburgh; Lord Moynihan Lecture of the Royal College of Surgeons, London; Honorary Surgeon to the President of India; and, Honorary Brigadier of the Indian Army. He was a recipient of the Indian National Science Academy (INSA) T.S. Tirumurti Memorial Lectureship and Dhanwantri award. He was decorated with Padma Shri (1972) and Padma Bhuşhan (1977). A quotation in his autobiography from Horace's third book of Odes reflects his feelings about himself, “I have erected a monument more lasting than bronze and taller than the regal peaks of pyramids. I shall never completely die”. He passed away on 13 December, 2003. Though severely handicapped with cardio-respiratory dysfunction, he remained intellectually active till the very last. On my return after training abroad, I joined my alma mater as a Pool Officer. Shortly afterwards, I was surprised to receive a letter from BR- already a highly respected person-welcoming me to the Neurosurgical fraternity. Forewarning me of the difficult journey ahead, based on his personal experience, he offered me all help and a hand of friendship. I had heard of him, but had never met him. I, a beginner, was overwhelmed, but eagerly wished to cash on this offer, which I did ever since. Our friendship grew with passing years. We visited each other, enjoyed the hospitality at each other's home, worked together on several projects and on several committees. At a time when no computers and internet existed, we shared the love of labour to edit the first edition of the Textbook of Neurosurgery, which later saw two other editions. I would be failing in this task if I do not mention the gracious and affectionate hospitality provided by Indiraji. Notwithstanding the presence of several house-helps and her own extremely busy professional life, she would personally serve the bed-tea and preside over the dinner table, attending to the minutest details of my somewhat unconventional eating habits. Both Mrs. Ramamurthi and he travelled to Delhi to be with us on our son, Nikhil's marriage, as also on the occasion when the Neuroscience Centre decided to celebrate my 70th birthday. Likewise, I was an invited guest for his 75th birthday celebrations. Much could be written but it would be enough to say that we became part of an extended family [Figure 17]. BR stood by his words mentioned in the letter referred to above. His invisible hand of friendship helped in diverse ways in our efforts to establish the Neurosciences Centre at All India Institute of Medical Sciences (AIIMS), New Delhi, and the National Brain Research Centre at Manesar, Haryana. This has been detailed in several earlier write ups. The Editor of Neurology India is grateful to Dr. K Sridhar, Department of Neurosurgery, Institute of Neurological Sciences and Spinal Disorders, Gleneagles Global Health City, Chennai, for his help in contributing the photographs of the article. Sridhar K. Prof. B. Ramamurthi: The legend and his legacy. Neurol India 2004;52:27-31. 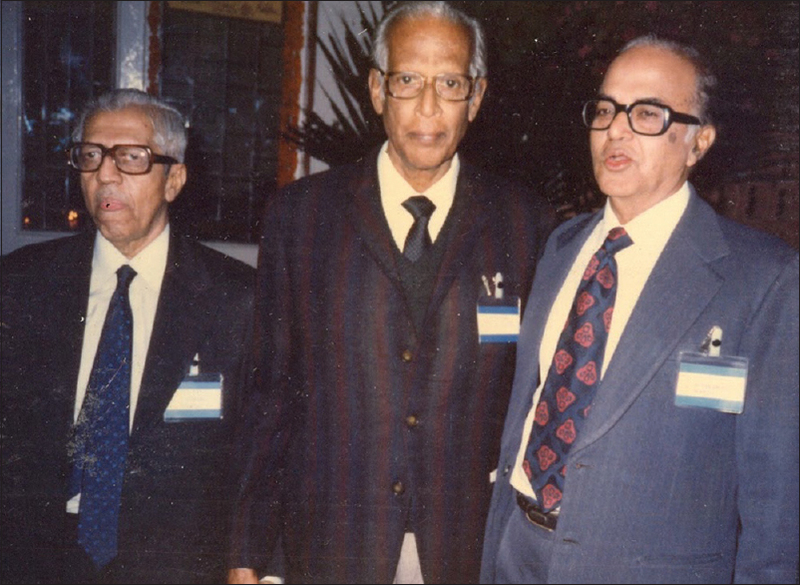 Tandon P N. Prof. B. Ramamurthi: Contributions to Indian neurosurgery (A personal tribute). Neurol India 2004;52:18-20. 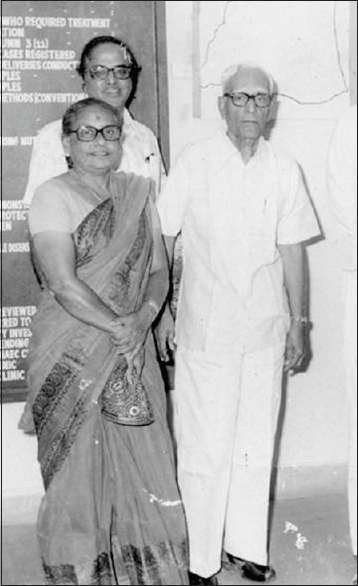 Ramesh VG, Bhanu K, Jothi R. The Madras Institute of Neurology, Madras Medical College, Chennai. Neurol India 2015;63:940-6. Nair K R. Organized neurosurgery: Additional facts. Neurol India 2017;65:443-5. Ramamurthi B. Uphill all the way. The Autobiography of Prof. B. Ramamurthi, Neurosurgeon, Madras, India. Achanta Lakshmipathi Neurosurgical Centre, 2000.